UC Davis plant geneticist Dario Cantu used a new sequencing technology and computer algorithm to produce a high-quality draft genome sequence of the cabernet sauvignon wine grape. A new sequencing technology, combined with a new computer algorithm that can yield detailed information about complex genomes of various organisms, has been used to produce a high-quality draft genome sequence of cabernet sauvignon, the world’s most popular red wine grape variety, reports a UC Davis genomics expert. Success of the new genome assembly, which allows researchers to assemble large segments of an organism’s DNA, also was demonstrated on the common research plant Arabidopsis thaliana and the coral mushroom (Clavicorona pyxidata). The findings are reported today (Oct. 17) in the journal Nature Methods. The three-pronged, proof-of-concept study used an open-source genome assembly process called FALCON-unzip, developed by Pacific Biosciences of Menlo Park. The study was led by Chen-Shan Chin, the firm’s leading bioinformatician. 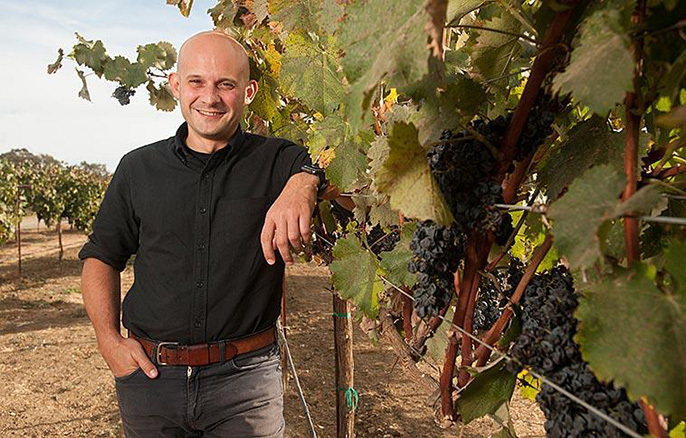 Lead researcher on the cabernet sauvignon sequencing effort was Dario Cantu, a plant geneticist specializing in plant and microbial genomics in the UC Davis Department of Viticulture and Enology. “For grapevine genomics, this new technology solves a problem that has limited the development of genomic resources for wine grape varieties,” Cantu said. “It’s like finally being able to uncork a wine bottle that we have wanted to drink for a long time. “The new process provides rapid access to genetic information that cabernet sauvignon has inherited from both its parents, enabling us to identify genetic markers to use in breeding new vines with improved traits,” he said. The first genome sequence for the common grapevine, Vitis vinifera, was completed in 2007. Because it was based on a grapevine variety that was generated to simplify the genome assembly procedure, rather than a cultivated variety, that sequence lacks many of the genomic details that economically important wine grape varieties possess, Cantu said. He noted that the new sequencing technology will enable his research group to conduct comparative studies between cabernet sauvignon and other historically and economically important wine grape varieties. “This will help us understand what makes cabernet sauvignon cabernet sauvignon,” he said. “The new genomic information that will be generated with this new genomics approach will accelerate the development of new disease-resistant wine grape varieties that produce high-quality, flavorful grapes and are better suited to environmental changes,” Cantu said. Warmer temperatures attributed to climate change are already being recorded in many prime grape-growing regions of the world. And in California, where the value of grape crops varies widely and is heavily influenced by local climate, it is especially important that new varieties be able thrive despite warming temperatures. “In a worsening climate, drought and heat stress will be particularly relevant for high-quality viticultural areas such as Napa and Sonoma,” Cantu said. The new sequencing effort may also answer some of the questions that have surrounded the ancestry of cabernet sauvignon for centuries, Cantu said. “Having access to this genomic information is historically fascinating,” Cantu said, noting that the cabernet sauvignon grape variety is thought to date no later than the 17th century. He noted that in 1997 UC Davis plant geneticist Carole Meredith used DNA fingerprinting techniques to identify cabernet franc and sauvignon blanc as the two varieties that had crossed to produce cabernet sauvignon. Funding for the cabernet sauvignon genome sequencing was provided by J. Lohr Vineyards and Wines. Collaborating with Cantu on the sauvignon cabernet study were Rosa Figueroa-Balderas and Abraham Morales-Cruz, both of UC Davis; Grant R. Cramer of the University of Nevada, Reno; and Massimo Delledonne of the University of Verona, Italy. In addition to lead author Chen-Shan Chin, other researchers on the overall sequencing study were Paul Peluso, Gregory T. Concepcion, Christopher Dunn and David R. Rank, all of Pacific Biosciences; Fritz J. Sedlazeck and Michael C. Schatz, both of Johns Hopkins University; Maria Nattestad of Cold Spring Harbor Laboratory; Alicia Clum of the Department of Energy Joint Genomic Institute; and Ronan O’Malley, Chongyuan Luo and Joseph R. Ecker, all of the Salk Institute for Biological Studies. How is climate change affecting agriculture?